Heat from me . Was bying them from B&Ms at £1.99 but they seem low on stock now cant find any in my local stores. 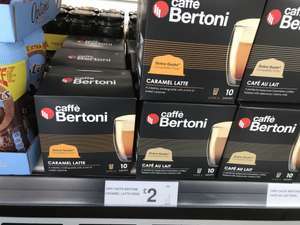 I dont drink coffee but the wife and kids say they are great and half price compared to buying Dolce Gusto ones.She will be pleased you found a new dealer oops meant seller of her favorite drug/drink. Heat from me . Was bying them from B&Ms at £1.99 but they seem low on …Heat from me . Was bying them from B&Ms at £1.99 but they seem low on stock now cant find any in my local stores. I dont drink coffee but the wife and kids say they are great and half price compared to buying Dolce Gusto ones.She will be pleased you found a new dealer oops meant seller of her favorite drug/drink. These are made with instant coffee! If you open one up after you use it you’ll notice there’s no coffee granules left over. Do you get x10 pods then x10 milk pods? Or is it just the x10 coffee pods?